Not far from the town of Hinche Haiti is an amazing water fall called Bassin Zim. There are a few caves at Bassin Zim that no one talks about. This is one of them. This cave is form from a white rock and it is not very deep. 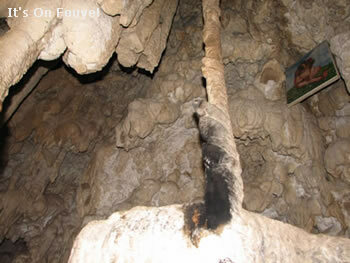 Many people who visit this site on a regular basis use this little cave to perform voodoo rituals. So don't be surprised if you walk in this little cave and you find an image hung in there with one or more 'bougie' lit on a rock. Haiti is a mystical place. It is a part of our culture.